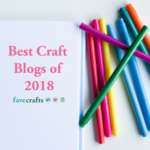 I have something special for you today – a pattern guest post! Lindsey from Winding Road Crochet approached me with a fantastic holiday idea for Red Heart Pomp-a-doodle – a Pompadoodle Christmas Tree! And it turned out so cute – read on to find out how to make your own on Moogly! Both written instructions and a video are included! 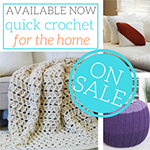 Hi, I am Lindsey from Winding Road Crochet where I share beginner friendly and family inspired crochet patterns! 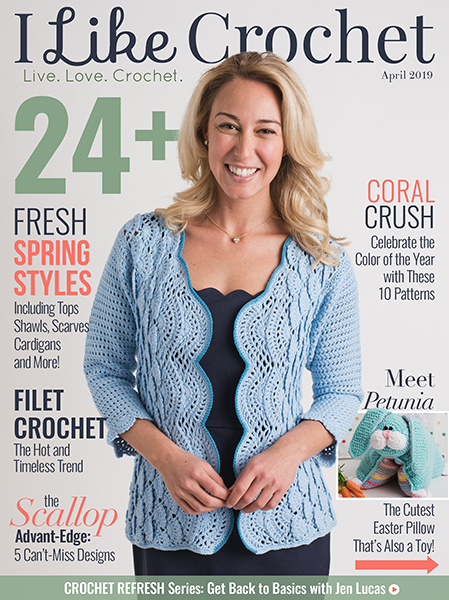 Nothing says I love you like a handmade crocheted gift. In our home, we love a handmade Christmas, handmade gifts, decorations and of course cookies! Christmas is a time to bring the whole family together and making our own Christmas decorations is something I really look forward to. 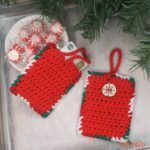 Being a crocheter, you can imagine a lot of my decorations include yarn, being a mother, a lot of my decorations have to be soft and durable to survive those little fingers. This Pompadoodle Christmas Tree meets both those criteria. To top it all this project is super quick, so you can make up a few trees and let the kids help glue decorations to them. 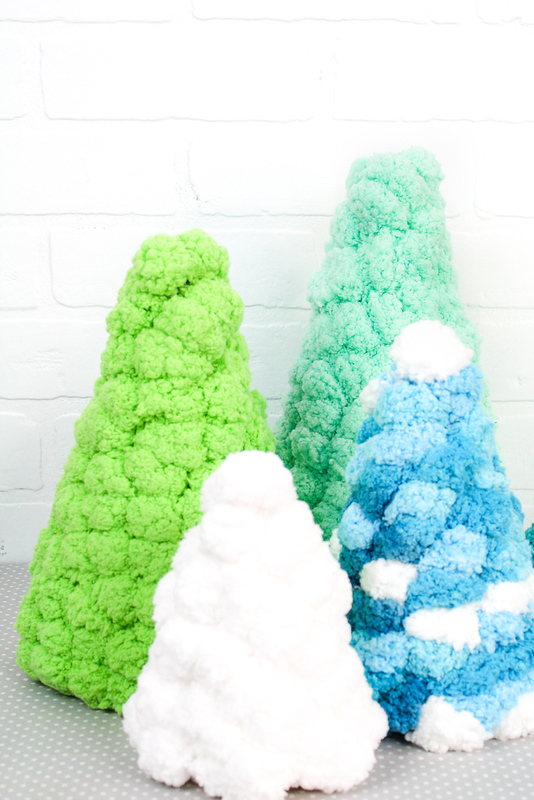 I have made a number of pom pom projects. It can be quite time consuming to make all the pom poms. 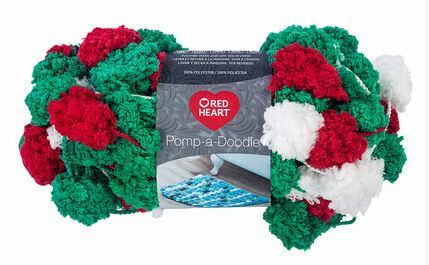 I was so excited when I heard about the Pomp-a-doodle Yarn by Red Heart. 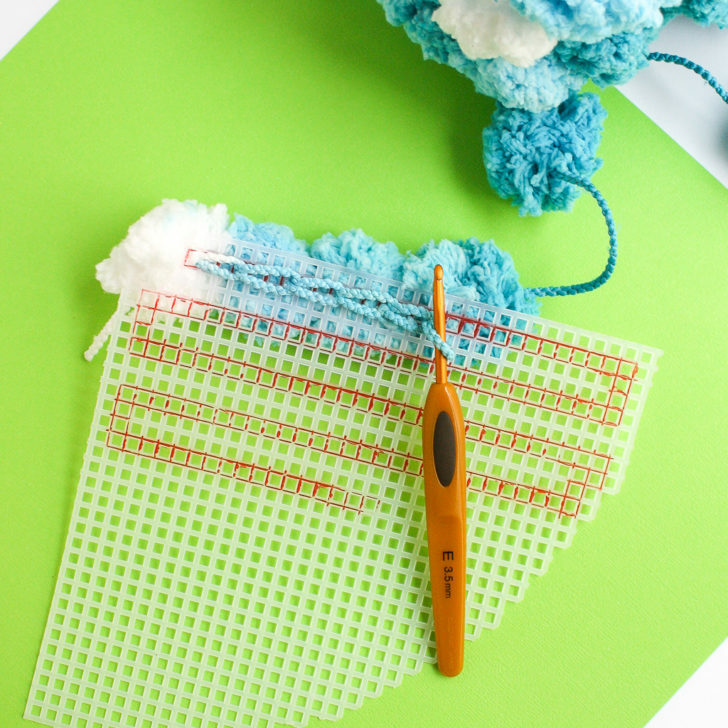 The Pomp-a-doodle yarn was just what I needed to make my pom pom projects faster and easier. I was already swamped with making most of my Christmas gifts. This yarn gave me the help I needed. To make the Pompadoodle Christmas Tree even easier, I created cutting templates for five different tree sizes. 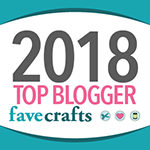 There is a template for an 11-inch tall tree here in this post and 4 more templates over on my blog! The trees range from 5 inches to 13 inches tall. This way you can make the perfect size tree to fit your decor. The templates also include a guide to follow while slip stitching the Pomp-a-doodle yarn to the canvas. Let’s go over what you will need! 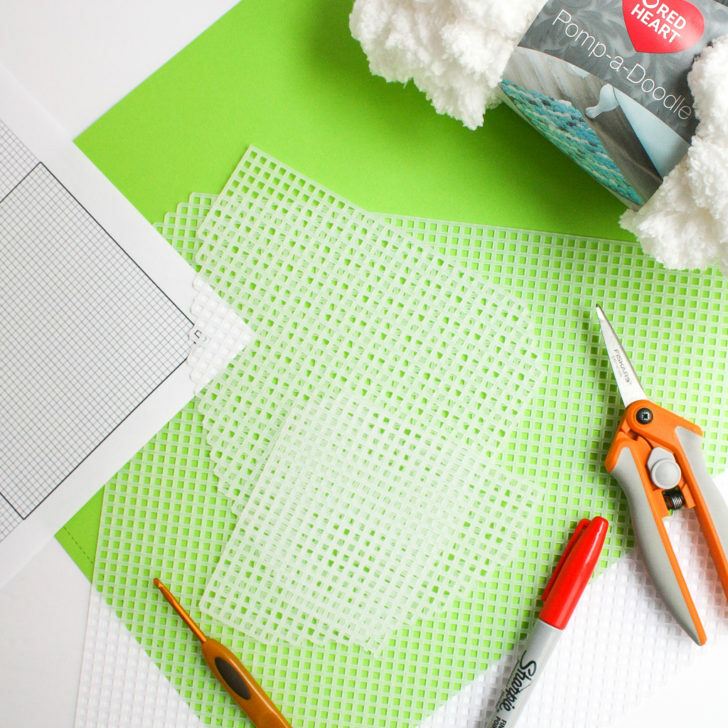 First, use the provided template to cut your plastic canvas to the right shape. 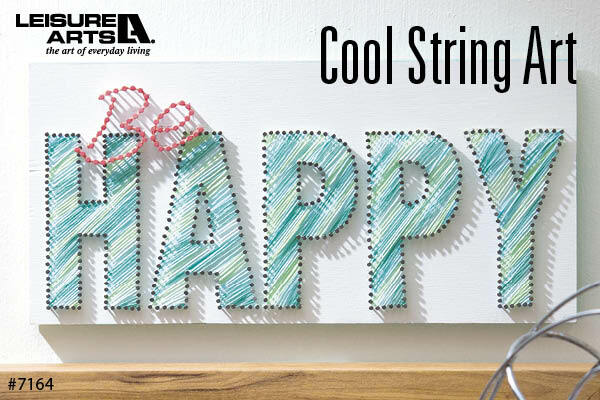 Then using a sharpie or other marker, draw the slip stitch guide onto your canvas. We will be slip stitching the Pomp-a-doodle yarn to the canvas. Make sure you first pom has some yarn before it. If there is no yarn before the pom, that pom will likely fall apart. Starting where indicated on the template, push your hook through the canvas and yarn over with the yarn directly behind the first pom, pull the loop through the canvas. Pull the loop up so you have about a 1/2 inch loop on the backside of the canvas. This should pull the pom securely against the canvas. Now, skip two squares along your slip stitch guide and insert your hook into the next square. Yarn over with the yarn that is between the first and second pom, pull up that loop and pull it through the loop on your hook, pull the loop until it is 1/2 inch tall. Pull until the second pom is against the canvas. This completes your first slip stitch. Skip the next two squares and slip stitch into the third square, this time you will be grabbing the yarn behind the second pom. Continue slip stitching along the guide you marked on the canvas. -Always skip two squares in between slip stitches. Even when the path gets a little wobbly near the curve. -All rows will stop one square from the edge. 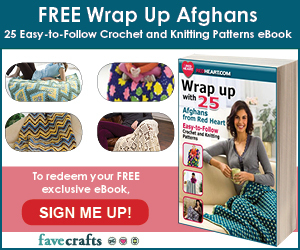 -You will be attaching a pom every other slip stitch. -Occasionally near the curve, you may have to make your best judgment where to insert your hook next. Don’t worry the poms of the Pompadoodle yarn make this project very forgiving. Once you complete your stitch guide cut your yarn and tie it off or add a little hot glue to secure it. 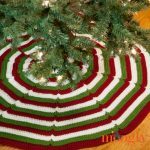 Use a piece of yarn and a yarn needle to sew the two straight edge of the tree together. I did this by placing the empty row on one side on top of the empty row on the other and sewing a running stitch through both layers of canvas. Using a matching Super Saver yarn single crocheted around the bottom of the tree. 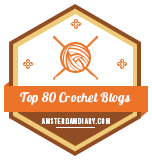 I place one single crochet into every open square. This is completely optional, but does make it look nice. The Pompadoodle yarn will cover about 98% of the canvas. Every tree I made seemed to have just one spot that needed a little extra coverage, so use your hot glue gun to pull the poms over and fill the gap. Finally, you are ready to decorate these trees or leave them plain. It is your choice. 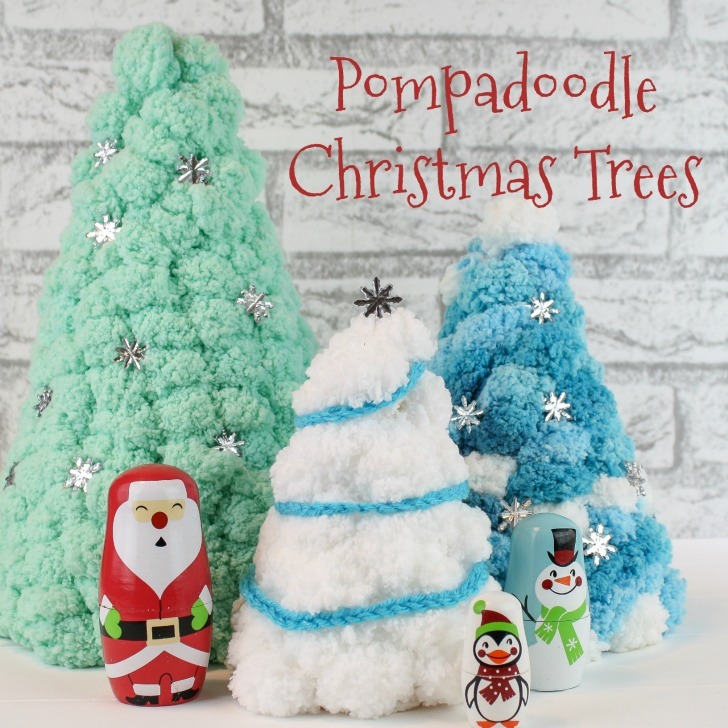 This Pompadoodle Christmas Tree makes a great project to have kids use Elmer’s glue and decorate the tree with buttons, ribbons or more yarn! 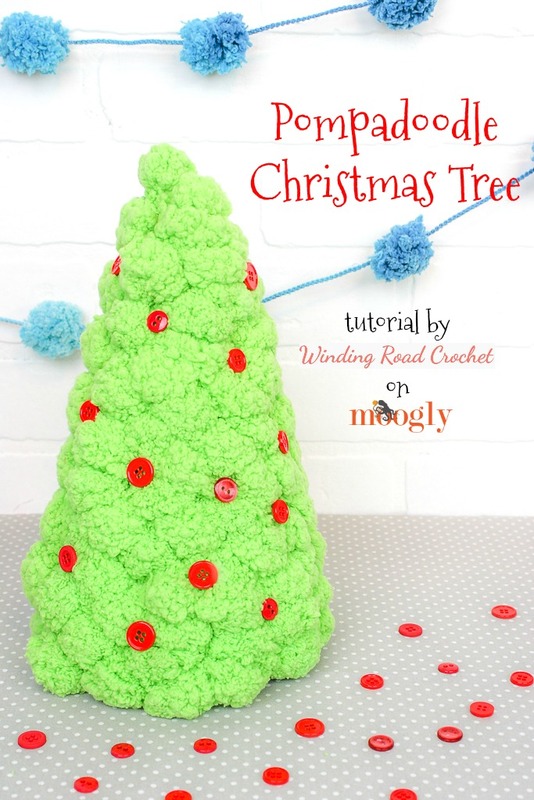 If this pattern inspires you to make your own Pomp-a-doodle Christmas Tree, and you post a photo on social media, be sure to tag me @mooglyblog or #mooglyblog so I can check it out too! I love seeing what you make! And another huge thank you to Winding Road Crochet for this fantastic pattern! 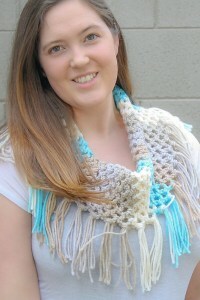 Be sure to check out her site and all her great patterns on Ravelry! Follow Moogly on Facebook, Twitter, G+, Pinterest, Instagram, and Tumblr! Thank you to Winding Road Crochet for providing this pattern, used here with permission, all rights reserved. Please do not reprint or repost this pattern, but please do link to this page to share this pattern with others. To print or download, use the Print Friendly button below, or go to PrintFriendly.com, or right-click to copy and paste it into a word processing document if those options do not work for you (please note that Print Friendly is a free outside website that the button links to, and you can click here for a tutorial on how to use it, but I cannot provide additional technical support for this service). I wondered what could be done with the pompadoodle. RH is really getting crafty! I wonder, is the template to scale with the plastic mesh canvas? Why not lay the canvas on the template and just trace it rather than counting spaces? Would that affect the size? Depending on everyone’s home printer settings to be just right is a risk – and of course home printers can only print up to a certain paper size!